There’s so much in this conversation. What will you take from it? It could be how Kate built up her SEO reputation to rank number one as a copywriter in Australia. Always spending 25% of her time marketing herself. It eventually paid off. It could be the transition from trading her time for money, to a more scalable ‘passive’ model. Switching 10 clients a month for 300 - maybe it’s not quite so passive. It could be building a team of other freelancers to help her do what she does best. Or dumping the guilt of the work-life balance myth and just giving herself a break. And all without having a plan?! 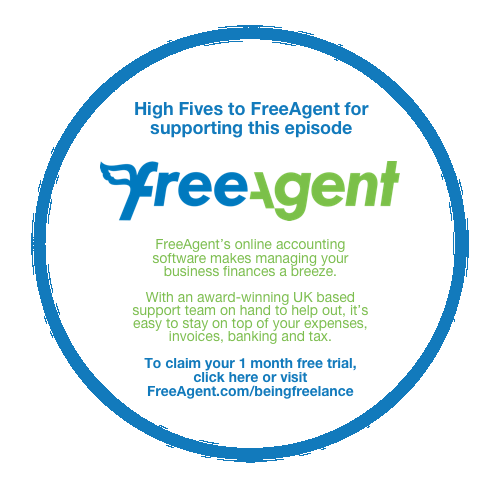 Steve Folland: Let's get started hearing how you got started being freelance. Kate Toon: Oh, you know I ask myself that question. Well, I used to work in advertising. I worked at lots of the big ad agencies. Came over here as a backpacker and got a job at Ogilvy in Sydney, which was quite swanky because I thought I was that impressive because I was British and obviously we're all very intelligent in England. Kate Toon: So I worked there for a little bit as a creator and also a producer. Came back to the UK, did a bit there. And then came back to Australia again. And I just wanted enjoying agency life anymore. It's very hard work. But I couldn't see a way of escaping. Kate Toon: But then I got pregnant and I had to give up my job. So I built a website and became a freelancer when I was five months pregnant. And then kind of worked it out from there. Steve Folland: And so when was that? Kate Toon: That was 10 years ago now. Steve Folland: If I look at your website now there's a lot on it. What was on your website when you first started 10 years ago? Kate Toon: You know what? It was black and it had flames on it because I was a hot copywriter. That's what I said. I know. Do you like the way I did that? It was an image and a word tied together. That's creativity. All those years in advertising paid off. Kate Toon: I don't know. I've done a bit of bits and bobs on the side like little jobs. So I had a few logos. I did anything when I started. So I did a bit of WordPress development, copywriting. I did graphic design which is laughable because I'm the worst designer ever. I did anything that would earn me money. Kate Toon: And then over time I kind of honed in on just purely doing copywriting and then SEO copywriting. And I did that solidly for about five years. Steve Folland: So when you were working, you know you've just become a mom, you've decided to go freelance. Where were you finding those first clients even if they were to do anything? Kate Toon: I think, you know, that first year it was definitely friends and family. So you know one of the tips I always give freelancers is to really tell people what you're doing. Because people don't understand what freelancing means. They don't really understand what copywriting means, if I'm honest. Kate Toon: So you know, I went out to people and said that this is what I'm doing. I'm writing, I'm doing this. Do you know anybody who needs anybody for anything? Kate Toon: I did a bit of stuff on LinkedIn back in the day when LinkedIn wasn't Tinder as it is today. I was a little bit lucky because I had worked in the agency scene here in Sydney so I could go back to some of those agency contacts and say, "Hey, do you need a person to do this?" But mostly it was friends of friends of family and things like that. Steve Folland: So a lot of that would have been working with the UK, would it? Kate Toon: No, because back that part I had already been working in Australia for four or five years. But I did still, yeah, occasionally get the odd UK client. But at that point I'd been back in Australia. I'd been working freelance in Australia for a couple of years. So I've built up a little group of connections and made some friends. Kate Toon: And you know, lots of your friends are starting small businesses or they're having an event or they just need a flier. So I mean it wasn't big money. I was kind of mopping up crumbs. But when you start I think beggars can't be choosers. You really have to just take whatever you get. And then you start getting recommendations and then it kind of moves on from there. Steve Folland: So, yeah, how did to move on from there? How did you evolve it? Kate Toon: Oh gosh. I mean I worked pretty hard. I know that sounds really obvious and boring but, you know, I am one of these people who sits at my desk from 9:00 till whenever and I don't get up and make a cup of tea. And I don't put washing on. Kate Toon: So I worked pretty hard and I worked really hard on marketing myself, which I know a lot of freelancers kind of don't enjoy. Or they get very wrapped up in their client work. But I put aside big chunks of time to make my website better, I got rid of those flames, I wrote a lot of blog posts, I did a lot of guest blogging, did a lot of Facebook advertising, worked on Twitter, LinkedIn, did YouTube videos. Really just to try and build up my name so that people would start thinking copywriter Kate Toon. Thankfully I have a silly name and that's helpful. Kate Toon: So I did a lot of marketing. And at first you feel like your shouting into the void because no one's listening. But over time it just chips away and you start to get a little bit of traction. Steve Folland: So what sort of stuff was that on the blog post and the videos? What sort of content was that? Who was it aimed at? Kate Toon: Well, I worked very hard on my SEO's. You know sort of SEO is kind of my super power. So I did studies. I really thought about what would my audience be searching for. And they wouldn't be searching for copywriter because most people don't really know what a copywriter is. Kate Toon: So people looking for a writer for a website. SEO's a bit more complicated these days. But back in the day, you'd write a page about how you were a writer for websites and what kind of websites you wrote. And I would create a piece of content for that. Kate Toon: And then maybe I'd do a whole page about video script copywriting. Then a whole page about press release copywriting. And slowly then the Google search was really where I got 80% of my clients so people who weren't looking for who I was but what I do, they found me that way. Kate Toon: And I went after longer tail keywords. So copywriter for financial services website. Not many people searching for that every month but all I need is two or three of those a month and I'm going to hit my financial target. So it was a lot of SEO and a lot of really thinking about what my audience was looking for. And then creating content to match that. Steve Folland: And did your SEO knowledge come out of the agency world? Or did you teach yourself it in order to get found? Kate Toon: It was a bit of both. So I had done a little bit of SEO but it was in its infancy back then. I mean we're talking 12, 13 years ago when things were very basic. Kate Toon: But when I became a copywriter the first thing I did was Google copywriter and saw how many there are out there. And so, you know, yeah, I did everything I now teach on my courses. I looked at the top 10 results, who was there, what were they doing, what content did they have on their sites, what could I do to improve on it. They've got a page about this. Well, I'm going to have a page about this and a page about this. They've got a page about video script copywriting. I'm going to have a page about video script copywriting with a checklist and a video and pictures. You know? Kate Toon: So it's called skyscrapering. You kind of see what other people are doing and you build on top of it. But then I also looked at who was linking to these sites. And then if they had a link from Bob's website, I went to Bob and said, "Can I have a link from your website." Kate Toon: So, yeah, it was hard yakka and I kind of did learn as I went along and experimented and failed. And that's been the foundation for my knowledge. And by the time I was about three or four years in, I was ranking number one to two for about 300 or 400 keywords related to copywriting. I mean I kind of owned Google. And I think I still rank number one for copywriter in Australia after Wikipedia even after all this time. So it paid off. It's a long burn but it does pay off in the end. Steve Folland: ... and a lot of work clearly. You said about setting aside chunks of time. Was that like every day? That whole thing where, as you said, we get swept up in client work, but you were clearly making time to do that work. Kate Toon: Yeah. So when I started off I only had like 20 hours a week maybe. 10 hours a week or whatever. I've always spent a good 25% of my time on working on marketing my business without fail. I come from an agency background where you're meant to be about 70% billable. So 70% of your time should be billable to clients. So that leaves you about 30%, 25% left to do other things. Whether that's admin, finances or marketing. Kate Toon: So it was a daily task. But when I say it's a daily task, I don't mean I wrote some fantastic 2,000 word blog post every day. I might just put a quote on LinkedIn. Or a really basic tip that to us seems obvious, but to someone else could be amazing. Do you know what I mean? Kate Toon: "Stop using the word we so much in your copy and start saying you instead. It will connect you more with your audience." You know, boom. I'm an authority, I'm a genius. I got 20 likes on LinkedIn. And someone may see that on LinkedIn and go, "Gosh, she's a genius. I'm going to hire her." Kate Toon: So I think the big thing is I didn't overthink it. I didn't have a grand strategy or a content plan. If something occurred to me, I posted it and then I moved on to client work. I didn't sit there waiting for people to like it. Kate Toon: So just little and often but definitely a good 20% to 25% of my time has always been spent on marketing. Steve Folland: Yeah. If I was to look at you now it might be speaking or books and courses. Has that all just gradually grown out of creating that content to promote yourself? Kate Toon: Yeah. So after about five years in, I've found that a lot of my audience wasn't actually clients. It was other copywriters and they were asking me for help and tips. And asking me for my template. So I created another business called the Clever Copywriting School to kind of service them as like a shop and a membership. I thought I can keep helping you for free but it'd be quite nice to earn a bit of money out of this. So I started charging. Kate Toon: And then the SEO stuff. When people think that you rank so well, they're like, "How did you do it?" And so, I'm like, "Well, I could run workshops and tell you. And then I could turn that into a little course. And then a book. And then another course." Kate Toon: So, it's about five years ago I really decided that I wanted to stop exchanging my time for money. Because there's only so many hours in the day and there's only so much you can charge an hour before you kind of reach a bit of a ceiling. So I tried to create passive income. Ha-ha-ha. What a laugh. And made some products that I could make once and sell. Kate Toon: And some of them have been great. Like I have a copy deck template that I sell. I think I've sold about two and a half thousand copies of that. It's just a Word document but that's a nice little trickle of income over the last five years. Kate Toon: Others, like the course, are not passive at all. You've got to be marketing them, you've got to be supporting them, helping people, answering questions. So I kind of thought I was exchanging my clients. I wouldn't have anymore clients. How wonderful. But instead of having 10 clients a month now I have 350 clients a month. You know what I mean? Kate Toon: So, be careful what you wish for. But, yes, it's all been very gradual. And now it looks like a lot but it's all just built up over time. Steve Folland: So do you not have client/client copywriter clients now? Kate Toon: Yeah. Very occasionally I will take on a copywriting job just to keep my hands in or just because it's a really cool job that I want to do. Like someone the other day wanted a video script written. And I love video script so I'll always drop everything to do those. Or if it's like an ad campaign. Kate Toon: So I still get about 30 to 40 leads a week through my website. I just pass them all on to my communities. So I say, "Hey look, I'm not free but here's two copywriters from my community who fit the bill." Because often they fit the bill better than I do. So, yeah, I do just pass a lot of that stuff on now. And it's good karma for my members and they enjoy that. Kate Toon: But I never want to give it up completely because I think then I'll forget all the problems and then I won't be able to help people. You know? Steve Folland: So you thought that it would be some sort of passive income, but clearly there's a lot of work involved? Kate Toon: Yeah. I mean there's opportunity to make a lot more money but there's a lot more commitment. I mean if you're selling a course, every day someone won't be able to log into that for whatever reason. Usually user error. But you have to help them find out what the problem is, answer that. Kate Toon: so a lot of customer services emails. You've got to have payment mechanisms, spreadsheets, Facebook groups, people signing in, signing out. So now I have a VA that helps with a lot of that. Kate Toon: And it sounds overwhelming and some days it does really feel overwhelming. I probably get nigh on 400 emails a day and notifications on social media. It's a lot. But you've built processes and automations and things to kind of deal with it. And then other days, you just turn your computer off and cry. Kate Toon: I do actually hark back to the freelance days. It's just an important thing to talk about I think. Because I think a lot of freelancers think, "Oh god. I've got to have a book. And I've got to have this. And I've got to have a course." But honestly, it's not really any better, it's just different. And ultimately I think we'll circle back to being a pure copywriter. I'll ultimately kill my darlings and just be a copywriter again because I enjoyed it and it's much more simple and it's much less pressure than having hundreds and hundreds of people in groups and on courses and things. Kate Toon: I sound very negative. It does sound negative. I don't mean to be negative. I don't mean to be negative. It's lovely but it's a lot of work. Steve Folland: I think that's important because it does seem like some sort of dream, doesn't it? Or that it can seem really glossy and easy and actually there's a lot of work involved both in maintaining it and marketing it. Steve Folland: At what point did you think to or feel like you needed to get help in the form of a virtual assistant? Kate Toon: I think when I was just crying a lot every day. Kate Toon: No. I mean I just felt that kind of tight chest feeling when I opened my inbox every morning and there's just so much. Kate Toon: And also a lot of the tasks were very repetitive and I was like, "This really isn't the best use of my time. I'm answering all these people individually when I could just sit down and make a video that would answer it for 100 people." But I need to have a bit of breathing space to do that. Kate Toon: So I started small. I got a VA for a couple of hours a week, and then a couple of hours more. The good thing about having an assistant is if they're smart they'll be like, "Hey, you know the way you've been always doing it like this? Why'd you do it that way? It makes no sense." And you're like, "Because I never looked at it before." And they'll come up with ideas. Kate Toon: And now I have a VA for about 30 hours a week and an accountant, and bookkeeper, and a designer, and an editor, and a proofreader. So it's a little team but none of them work for me. They're all freelancers themselves. So I'm kind of hoping I'm helping the freelance economy a little bit by passing on the love as well. Steve Folland: Wow. So you've gradually thought ... What came first actually? Was it the virtual assistant out of all of those? Kate Toon: No, the first thing was the accountant. And I would say to anybody to get an accountant. So I use accountancy software. But I don't know anything about tax and I have no interest in it so that was the first thing I got. Because I don't like money. I don't understand it. So that was the first thing. Kate Toon: And then there was a developer. And then a virtual assistant. I have eight websites so just keeping all of them up to date with plugins and hosting is a nightmare. So again, I was like I don't want to do that and give to someone else. Kate Toon: I love that metaphor. I think that's perfect. They're self-sufficient. They lick themselves. That's like their thing. Steve Folland: They know what they're doing and they go away and do it, don't they? Steve Folland: But the others, they need managing. Steve Folland: So how have you found that? Kate Toon: So I use a software called Asana to manage tasks. I used to use Basecamp but I've moved over to Asana. I like it a bit more. So I can put tasks in there and prioritize them, and give them dates, and assign them to people. So that's really good. Kate Toon: I use Slack to stop emails. So I don't like getting hundreds of emails so we use Slack and we have different channels for different clients or different jobs. So everything goes in there and I can read back through. Kate Toon: I use Loom, which is such a great tool. It enables you to make little screen videos of what you're doing. So when i first started out I'd be like, "Hello. This is me doing this thing in a spreadsheet. Click here and click there." And then you make a little Loom video and you save it. And then the VA can watch that whenever they need to do that task until they understand it. Kate Toon: So I think when you get someone to help you, there's about a two to three month curve before they're fully autonomous, before they can do the whole thing end to end without asking you a question. And then you get to the point where I am now with my VA where I'm like, "Can you put the thing on the thing and don't forget to add that red thing." And she knows exactly what I'm talking about. She's a very patient woman. Kate Toon: So it takes time and you need a few different softwares. And you know there will be a period where you're like, "It would be so much quicker to do this myself." But just invest that half an hour and you'll never have to do that thing again. That's my approach. Steve Folland: And then when it came to pricing, did you find anything tricky with that? Because obviously it's not just you, there's all these other people. And I guess you don't even know how many people might buy something. Steve Folland: So it must be hard to figure out what income is going to come in. Kate Toon: Yeah. I mean, when I was a freelancer I was very clear on my rates. I used calculators to work out my income, my hours. I was very clear on that billable time. And I need to make this much a month. So say I needed to make $10,000 a month, how many jobs of this type of job do I need to do to hit that? And then I'd create packages and rate cards. Kate Toon: And as you said, it's much cleaner, isn't it? I do five websites, I charge two and a half grand a website, I'm going to make this much money. But with my courses and stuff now, I don't really know. So I'm literally just about to launch my big SEO course which I do three times a year. And I don't know if it's going to sell. I don't do any online advertising and I don't have an affiliate program. So really, it's all content marketing. All of it is just word of mouth and all the stuff that I do on socials. So I don't know. Kate Toon: But I find that quite exciting. It could fail miserably. And then I'll have to think of something else to do. But, yeah, I don't know. It's always interesting. Steve Folland: Did you build up a buffer of money as you went along when you were freelancing that enabled you to have that freedom to invest in yourself? Kate Toon: No. So I had a year where I was still freelancing full-time and trying to build this stuff on the side. The side hustle. And that was really a miserable, miserable time. So you know like working all week then taking Saturday to try to build videos for a course. And it was really, really hard. Kate Toon: But what I did was I sold the course, then I made it. I sold like 20 spots on it for X amount. And that was enough proof of concept that then I would make it. So I was literally making videos and worksheet the night before they were due to be released. But I didn't want to build the thing and then hope people would come. I wanted to sell the thing and then make it. Kate Toon: But, yeah, I had a few tough years. It's a lot easier now because everything's built and I'm just tweaking it. But it was hard. There's no denying that I worked some very long hours and was very stressed. And I had no buffer. Kate Toon: Now I have a buffer. And I think as a freelancer it's great to have the ... I was going say F off money. I'm not sure I'm allowed to say that. The go away money so that you've got enough money to go, "Actually I don't want to work for that client. You can go away and I'm going to be all right because I've got three month buffer in my bank account that means that I don't have to accept every job that comes in." Steve Folland: This whole story started with you becoming a mom. Steve Folland: So, hidden away in amongst all of this as well is the pressures of family life and work life balance. How have you coped with that? Kate Toon: Well I don't think there's any such thing as work/life balance. I think it's a bit of a thing that was sold that we're meant to be these awesome working beasts and be great parents. I just think you go though phases where you're a good parent and then you're good at your job. And I think it's very hard to do both at the same time. And we need to give up that guilt. Kate Toon: My husband is also self-employed. We've made sacrifices. We try and be there for pickups and drop offs. We occasionally missed the event at school. You just do your best. And I think I've really tried to give up on that guilt and go, "I'm a good example to my son of a woman." I mean whether you're a man or a woman. But someone who's making their own money, working for themselves. I'm at home a lot. Yes, I'm not necessarily sat next to him watching him play Fortnite. But I'm here and he's loved and he's provided for and I think that's all you can do. Kate Toon: And at least I'm not commuting two hours a day to some horrendous office job and getting home after he's gone to bed. So I kind of give myself a bit of a break on that one. Do you do the same? Kate Toon: You've got kids. Steve Folland: I'm feeling the same about Fortnite. The way I justify that is when eventually Armageddon comes, he can look after me. Steve Folland: He's a fabulous sniper and I feel like I'm going to be okay. Kate Toon: We had a great discussion about silencers yesterday. And I was really delighted that my 10 year old knows what a silencer is. Well, what a beautiful time we live in. But there you go. Steve Folland: Yeah. You're right. It's that whole you can feel guilty when you're working and guilty when you're not working. It can be really hard to shrug that off and just think, "Oh do you know what? I'm just doing okay." Kate Toon: I'm doing my best. And I think kids are just happy that you're there. You know? And I think boundaries are important. So these days I do not work at the weekend. It would take no amount of money or rush fees would make me work at the weekends. Kate Toon: I don't really do much stuff in the evening apart from this wonderful podcast, which I'm very grateful to do. And I've kind of set time boundaries. But that doesn't mean that I'm not sometimes sort of half listening and doing some social media on my phone. That's just life. You know? Kate Toon: I think it's really hard running your own business. That's why most people don't do it. Steve Folland: Yeah. You mentioned clearly we're doing this podcast but, yeah, you have three of your own. Steve Folland: How did you first start doing that? Presumably you're enjoying it because you've been doing it a few years. Kate Toon: Well, I love talking to people and I'm sure you do too. You meet some really amazing people doing it. My friend Belinda got me started. We have a podcast called the Hot Copy podcast where we talk about copywriting. And she really drove that and she asked me to be involved with it. And she's kind of kept it going because I am a bit lax. Like I'll be like, "I don't want to do it this week." And she's like, "We have to." Kate Toon: And it's been powerful in terms of building up authority. And when people listen to you week after week after week, either they hate you or they grow to really like you. I mean I would take a bullet for some of the people who present the podcasts that I love. Like Reply All and This American Life. I love them. It's a really intimate connection because usually you listen to podcasts when you're doing something you enjoy like walking the dog or having a bath or something. And so you become associated with that enjoyable thing and I think people grow very fond of you. And it's been very powerful for my business. And I just really enjoy it, I think. Steve Folland: So it sounds like having almost like the accountability of somebody ... like doing it in a pair ... has helped. Kate Toon: Yes. it has. And the one that I have that I don't do in a pair, the SEO podcast, if you look at the episode release dates you'll see it's like, "She released three in a week," and then there was none. And then two and there was none. Kate Toon: I really think consistency is highly overrated. I have to say that to myself. So I'm consistent in turning up every day and doing the things. But no one's going to die if I don't release a podcast this week or if I don't do that Instagram post. No one cares. Kate Toon: So I think we just put too much pressure on ourselves. If it's there people will enjoy it. But no one's going to be writing me angry emails going, "I was expecting a podcast on Wednesday and it wasn't there." And if they do I will be like, "Get a life. Go outside. Hug a tree." Steve Folland: Yeah. I've said that to people. Where you go, you know, ultimately if you can't do it, it doesn't matter. And yet, finding that consistency, like getting into the rhythm of something definitely helps you get going. Like if you hadn't got into the rhythm of writing your blog posts or whatever, it wouldn't have grown the way it did. Kate Toon: It wouldn't but now that's gone out the window. And now I have no consistency and no rhythm. And I desperately try to say, "Monday's will be the day for this. Tuesday's will be the ..." I'm a very hospital corners kind of person, I like things to be organized. But business just isn't like that. And I've just given up trying to squeeze it into little boxes. Things come up and you can't just go, "It's Tuesday. I don't do this on a Tuesday." Because life doesn't work like that. Kate Toon: So I just do what I can and I just chip away and I forgive myself a little bit. And a I said, most people don't care I think. They're just glad when you do something good so they're happy. Steve Folland: Yeah. So you've obviously built your own community of copywriters online. How about in real life as well? Who's around you face-to-face? Kate Toon: It's funny because the first five or six years of my business I was really anti-networking and actually meeting humans. I think I'm an ambivert. So I do like being sociable but I like it to stop when I want it to stop. Like, "I'm done now. I want to go home." Kate Toon: But this last couple of years I've really tried to get out and meet copywriters. I launched Australia's first copywriting conference over here a couple of years ago. I've run that twice now where we had about 160 copywriters come together. Who knew there were that many copywriters in Australia? I don't know. Kate Toon: And now we have regular meetups around Australia. So I go to Melbourne and Sydney and we meet up and it's great. I think being a freelancer is hugely isolating and obviously places like Facebook communities are fantastic for building connections. But physically meeting someone and having a cup of tea or a glass of wine, there's nothing like it. There really isn't. And so I really try and encourage that now. For myself and for the members of my community to try to bring them out from their pajamas. Out of their bedrooms and into the real world blinking and terrified. But it's good. Really good. Steve Folland: Man. I mean how did that feel? Like putting on a conference. That's quite a thing. Kate Toon: It is a thing. And I don't know anything about even management. But I'm the sort of person who says, "I'm going to run the marathon," and they put it on Facebook. And they're like, "Oh god, I've told everybody. I'm going to have to run the marathon." So that's what I was like. I was like, "Let's have a get together." I think I had about 70 people in my community then. "Let's have a get-together and we could all do a bit of speaking and it'd be good." And then it evolved into an event. It got a bit bigger. And then we had more people. And then I was working out are we going to have cupcakes and what we're going to have for lunch. And then it was conference. Kate Toon: So it kind of evolved again. You know? And then the next year I was a bit more confident so we got a bigger venue, we had more people, we had more high profile speakers, we had somebody dial in from the US. It was all very impressive. Kate Toon: And then next year it's in Melbourne in a very iconic building. It's called the Melbourne Arts Center which is quite famous over here. And it's even bigger. And I'm flying people in from America and stuff. I don't know what I'm doing. Kate Toon: Sometimes I look at myself and I'm like, "Who the hell do you think you are?" But it just all evolves. And the good thing is the copywriting community is really supportive. So they're all like, "Yep, we'll buy a ticket." And they do. It's not like these people who go, "Yeah, run an event." And then you run it and they're like, "Yeah, I can't come." They actually turn up. Kate Toon: And it's an event for the community and they support it. It doesn't make me a huge amount of money. But that was never the goal. But it's really good fun. It's like planning a big party once a year. And I get to chose all the decorations and stuff. It's fun. Steve Folland: When you quit your job to have your kid, you didn't have this goal in mind, did you? Kate Toon: I had no goal in mind. I just wanted to earn a bit of money because my husband was just starting out doing his business. And I never had a business plan. I don't set goals. I don't set targets. I don't sit down at the end of the year and go, "What's my why? What's my higher purpose?" I just keep on keeping on. Kate Toon: And I always judge everything by three things. Will I enjoy it? Do people want it? And will it make me money? And if it ticks those three boxes ... it doesn't have top make a lot of money necessarily ... but that's enough for me. And it's worked for 10 years. Kate Toon: And I think the thing is opportunities come up and if you're not stuck to some rigid business plan you can take them. You can experiment. You can have a go. And if it fails, well, who cares. Kate Toon: So that's always been my approach. And I still don't have a business plan. I don't know what I'm doing next year or the year after. I don't really know what I'm doing next month. So, yeah, I just keep on keeping on and that seems to work. Kate Toon: That it will all be okay. That the feast and famine is part of it. And if you try to think that there will never been feast and famine ... It's always going to be feast and famine. It's going to be highs and lows. And that's the joy of it. But it's so worth it. Kate Toon: I wish I'd done it a bit earlier. I think I wouldn't have been as good a freelancer because I'd have been too immature. But I'm so glad I went freelance. I wouldn't go back to a real proper job if you paid me a fortune. I just love the freedom and the creativity. So I it would just be it will all be okay. There will ups and downs. It's a roller coaster but at least you get to choose your own seat. There you go. Steve Folland: Kate, thanks so much. All the best being freelance. Kate Toon: Yeah, thank you so much.